After an entire year of sitting on the edge of our seats and biting off the tips of our fingernails, the wait is finally over. The Hunger Games: Mockingjay, Part 1 hit theaters Nov. 21, and it was well worth the agonizing anticipation. In The Hunger Games: Catching Fire, the prequel to Mockingjay, Katniss Everdeen (Jennifer Lawrence) and Peeta Mellark (Josh Hutcherson) are forced to compete in the Hunger Games for the second time, but with a twist; they are pitted against past Hunger Games winner from every other district. Katniss and Peeta rely on each other and form alliances with other winners as they endure a new, even more difficult arena than that of their first Hunger Games. By the end of the movie, Katniss devises and executes a plan to destroy the arena, forever ending the Hunger Games, and wakes up to her best friend Gale Hawthorne (Liam Hemsworth) telling her that Peeta was captured by the Capital and District 12, her home, no longer exists. 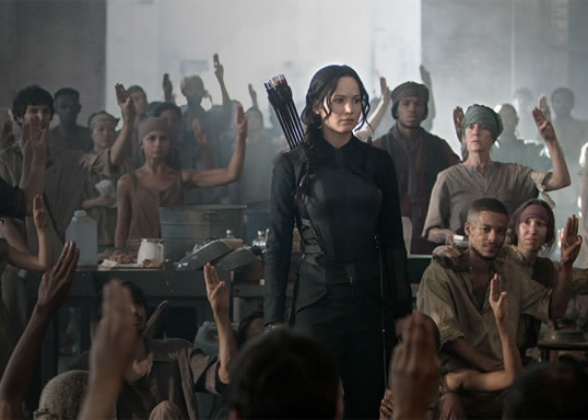 In this part of the “Hunger Games” saga, Katniss Everdeen takes her place as the symbol of Panem’s revolution (Photo courtesy of luckymag.com). Mockingjay starts off with Katniss in a hospital located in District 13, which was allegedly destroyed during Panem’s first rebellion. Unable to bear the loss of Peeta, Katniss suffers a mental breakdown. A rebellion against the Capital has broken out and, in order for everyone to truly come together, they need someone to be the face of their rebellion — they need Katniss. Katniss, still trying to grasp what is left of her sanity, refuses to take part in their rebellion, blaming them for Peeta’s capture. It is not until the Capital sends out a broadcast with Peeta asking the districts and Katniss to end the rebellion that Katniss realizes Peeta is still alive and there is still hope left. With the help of President Coin (Julianne Moore) and her trusted friends, Katniss becomes the rebellion’s symbol or “Mockingjay,” and fights to save Peeta’s life. As usual, Jennifer Lawrence delivered an outstanding performance. By pouring her heart into her performance, Lawrence allowed herself to become one with her character. Lawrence’s conviction and dedication to the role gave her a camera presence that captivated the audience and left them wanting more, from her moments of borderline insanity to unbearable rage and despair. Although Josh Hutcherson was not present in the movie as much as Lawrence, his performance spoke for itself. Without even having been together in the same District, the chemistry, not necessarily romantic, between Lawrence and Hutcherson’s characters was spot on. Miles apart during many key parts of movie, the actors were able to convey to the audience that both characters still do care deeply for each other, and no amount of distance or brutality could change that. The cast as a whole did a fantastic job. Each and every character worked perfectly well with one another, making the relationships in the movie much more poignant and believable, despite the shocking and dramatic events that were taking place. Julianne Moore’s performance was no short of fantastic either. Mockingjay was her first appearance in the Hunger Games series, and she was definitely a force to be reckoned with. Moore portrayed her character very well by showing off her authority and complementing it with a sense of humanity. It is no secret that the book Mockingjay was not as widely beloved as the other two novels in The Hunger Games series, and there was reason to doubt that Mockingjay as a movie would not be as successful as its predecessors. However, the producers immediately put an end to those rumors the minute Mockingjay hit theaters. The movie was outstanding and greatly exceeded my expectations. It was filled with action and contained multiple moments of suspense that made you anxious, assuming the worst for the characters. On top of it all, the moviemakers were able to add humor into the story in a way that eased the tension built from the events within the film itself without coming off as overdone. Overall, the movie was a complete success, from its phenomenal acting performances, to its spectacular use of action, to its brief moments of comic relief. I am a hard-core Hunger Games fan, so I was confident that I would love the movie before I even set foot in the theater. However, I can honestly say Mockingjay was a great movie and definitely worth watching. Volunteer yourself to go watch this five star movie, and may the odds be ever in your favor.